CRAZY DISCOUNT! Was: $699.95 Now: $369.96! 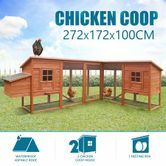 Update the living space of your chickens, rabbits, ducks and other poultry with 2.72m extra-large chicken coop with two houses. 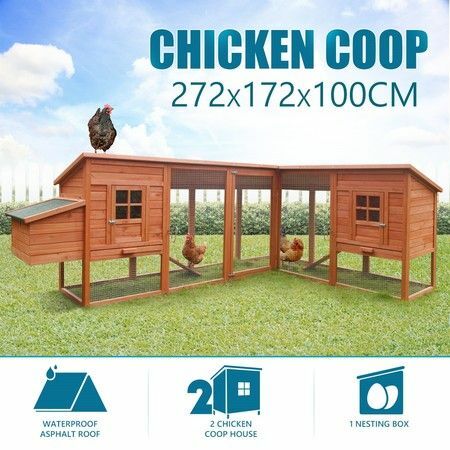 Constructed in quality fir wood with green asphalt roof, the chicken coop will protect your pets from sun or rain and endure years of use with regular maintenance in your backyard or farmland. The rabbit hutch has two storeys, mesh cover with metal slide latches, ensuring your flock of guinea pigs having a safe and secure retreat. The chicken run also comes with generous closed play area, offering an outdoor space for your poultry to move around and get fresh air without fear of any outside threats. The integrated nesting box provides a perfect place to collect fresh eggs. The pull-out tray design will make cleaning the rabbit cage effortless. Spacious integrated ground enclosed play area for moving around without the fear of predators.